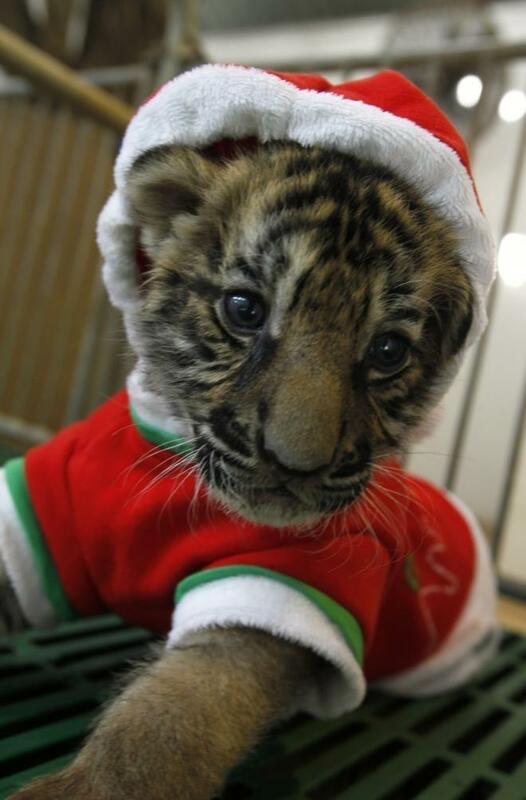 A tiger cub in a Santa Suit (from Emergency Kittens)! My vague plan for Sunday was to pack up & check out of the hotel, watch the Seahawks game, watch some of my Christmas movies, and get some housework done. Of course, I hadn’t discussed specifics with Michael. So we were eating brunch at a place we stopped at on the way home when all the plans started falling apart. Unloading the car filled up the living room, and while I had meant to work on putting things away while watching the game, I just didn’t have the energy. Also, with Michael asleep in the bedroom, about half the stuff I needed to put away couldn’t be without disturbing him. I took some cold meds, which helped only a little bit. Michael woke up just before the disappointing game ended. And soon we were shopping. I tried not to be cranky, and Michael said I wasn’t too bad. We got the shopping done, we had dinner at a sushi bar we sometimes go to. I felt a bit better after eating, but still felt as if I were coming down with a cold. When we got home, the sight of just what a mess the living room was pretty much wiped me out. I decided to take a nap. Many hours later, I woke up to find the house empty. Most of the present Michael had bought for his co-workers were wrapped on the floor in the living room, and all the wrapping stuff was scattered about. I had the vaguest recollection of him saying something about going to buy some gift bags, but wasn’t completely certain I hadn’t dreamed it. I checked his location on the phone, and saw that he seemed to be at one of the stores within walking distance. So I made some coffee and started loading the dishwasher. While I was doing that I finished waking up, and realized that my sinus/throat symptoms had receded back to typical background hay fever level. Since I hadn’t taken any medication since before the shopping trip, I figured that all the symptoms was more likely due to not sleeping as well as I thought at the hotel. Plus, any time I stay at a hotel, by the end of the stay my sinuses are all messed up. So I got the living room somewhat less of a mess. Michael came home and finished his wrapping. We discussed plans for tomorrow (I’m off, he has to work, his company party is in the evening). I was going to watch one of my Christmas movies while I finished things up, but I had gotten an email back from the developer of one of the Fireplace apps I had downloaded and found lacking. So I tried what he suggested and was able to get the app to stream more or less to the TV. To test it thoroughly, I needed to let it run for a while. After about an hour, it just stopped streaming for no discernible reason. And no matter what I do, I can’t get music and the fireplace streaming to the TV at the same time. So, being a good little developer, I wrote up a bug report and sent it off. I am not going to go amend my one-star review, though. While sorting out our schedule, I realized that I kept making lists of things that I’d like to get done on my two days off before Christmas, and it’s really a week or two worth of activities. Which is crazy. Particularly since about half the items are various kinds of goofing off, such as watching a bunch of the Christmas movies. Trying to squeeze in all of that stuff will make my short Christmas vacation more stressful than a road trip to have Christmas with the most dysfunctional comedic family imaginable. Which is the exact opposite of what a vacation ought to be. Particularly having read a view of the dysfunctional family issues some of my friends are dealing with, I really don’t want to be that stressed. So, while I will do some more housework, and will probably watch at least one of the Christmas Carol adaptations and another Christmas movie or two, I’m going to limit my to-do list to things that have to happen. And anything else that happens will just be a bonus. Or maybe I should think of it as a Christmas present.